San Francisco is one of the world's great cities, not just because of its beauty but because of its culture. That culture is threatened directly by the high cost of housing. Unless we do something, we will lose our artists, our progressive politics, our immigrants and our young people. Even middle-class families will be forced out, except for those lucky enough to already own their own home or have a rent-controlled apartment. We will become a city populated only by the wealthy and by a relatively small number of the poor who were able to obtain a subsidized housing unit. The gates will be closed. These are the reasons we need to solve the city's housing crisis. The immediate cause of the problem is straightforward: We are not building enough housing to accommodate the people who want to live here. This is true not just for San Francisco, but for the entire Bay Area. Yet San Francisco, as one of the three major cities in the Bay Area, will need to take a leadership role in solving the region's housing crisis. As we compete with each other for the limited number of housing units, we drive the price of housing — both rental and ownership — ever higher. In economic terms, we have an imbalance of supply and demand. The underlying reasons for this situation are more complicated. They include an ineffective regulatory system that makes it very difficult to build new housing, the growing inequality of wealth in the United States and many others. This second edition of our housing strategy updates and brings into one place the policy reports that define SPUR's housing agenda and reports back on progress made since these reports were originally published. It recommends actions to remedy the causes of the housing crisis that lie within our control in San Francisco. It presents a set of proposals that can be implemented today, on a local level. If these ideas were put into practice, housing production could be expected to increase dramatically. If this continued for several years, San Francisco could once again be a place that is welcoming to new arrivals from around the world. The printing of this report was generously funded by the Urban Land Institute and SPUR members. 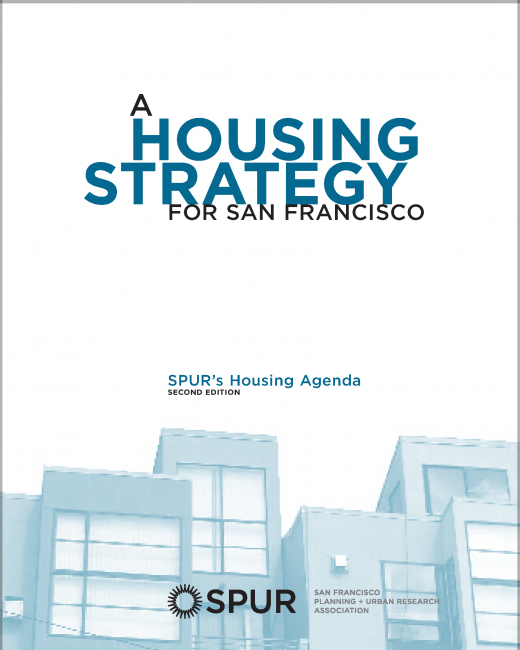 The SPUR Housing Committee originally developed the ideas in this report under the leadership of S. Osborn Erickson, Tom Jones and George Williams.